Fire Beacon Hill is an area of Lowland Heath situated 5km north of Sidmouth and 2 km north-west of Sidford at the southern most end of East Hill. East Hill is a prominent ridge over looking the fertile Otter valley. left: The approach to Fire Beacon Hill heathland. The reserve comprises 26.39 ha of dry acidic, lowland heath; acidic grassland and bracken with secondary woodland. The planning authorities are Devon County Council and East Devon District Council. 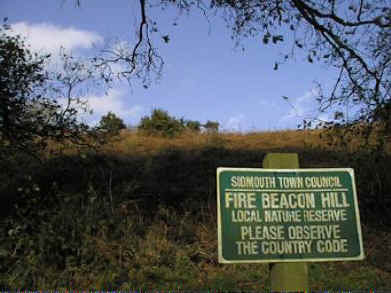 Fire Beacon Hill lies in the parish of Sidmouth. Fire Beacon Hill lies at the southern end of East Hill, a south-west to north-east running ridge which has a capping of clay-with-flints and chert overlying Cretaceous Upper Greensand. 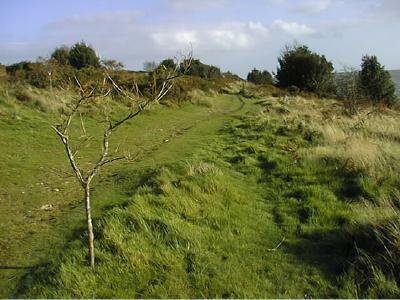 This geology is characteristic of the hills in East Devon and often supports similar areas of Lowland Heath. The triangular site is bounded by to the west by a conifer plantation, to the east by mature deciduous woodland and to the south by farmland. 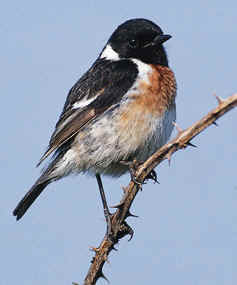 Several nationally uncommon species occur on the heath including the Grayling butterfly, and breeding Stonechat, Dartford Warbler and Nightjar. Recent management has included tree planting (prior to 1992), with bracken control (rolling, scraping and spraying), gorse coppicing and firebreak creation after 1992. Sidmouth Town Council have been the freehold owners of the land since 1980. An agreement between the Town Council and East Devon District Council was signed in 1992 declaring the site to be a Local Nature Reserve. The Town Council are responsible for the management of the reserve. left: on top of Fire Beacon. Fire Beacon Hill is part of the East Devon dissected plateau, comprising calcareous Upper Greensand capped by clay-with-flints and chert (in part Eocene) and overlying Keuper Marls. The northern part of the site is 225m above sea level and is relatively flat but the ground slopes steeply to the south down to 150m. The site is relatively diverse given its small size. Approximately 12.66 ha is Lowland Heath, 3.92 ha bracken and acidic grassland, 6.71 ha bracken and invasive trees, and 3.10 ha woodland. However species diversity is relatively low although nationally important.